Dive into the world of luxury sports cars with this 4-hour skip-the-line visit to the Ferrari Museum in Maranello from Bologna. See the exhibits in five rooms, plus an exhibit of World Championship cars. Get picked up at your hotel in central Bologna and travel to nearby Maranello, where the Ferrari Museum and factory are located. Arrive at the museum and enjoy skip-the-line access to visit the exhibits for free, or choose to pay €5 for an audio guide. Browse through the five themed rooms in the museum. See the incredible collection of automobile artifacts on display, including an exhibit of World Championship cars. Test drive a Ferrari outside the museum. Your driver will wait outside the museum for 2 hours as part of the tour; any additional waiting time that's required costs €25 per hour. Choose to depart Bologna at any point from 8:30am through the early afternoon, and return to your Bologna hotel at the end of your visit. 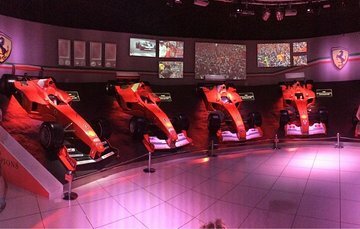 Awesome experience.The history of Ferrari in formula one was incredible to see.Put together beautifully.